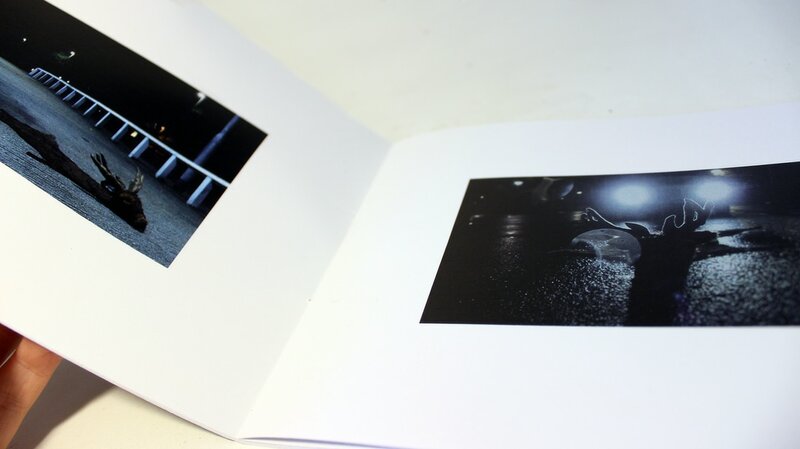 In addition to my film, I printed a number of stills. I felt the film had a number of textures I wanted to explore physically however when it came to printing the colouring was so dark that the textures were not visible. The book instead maps the film like a graphic novel or a storyboard in a similar fashion to my final outcome for the Text and Context project. 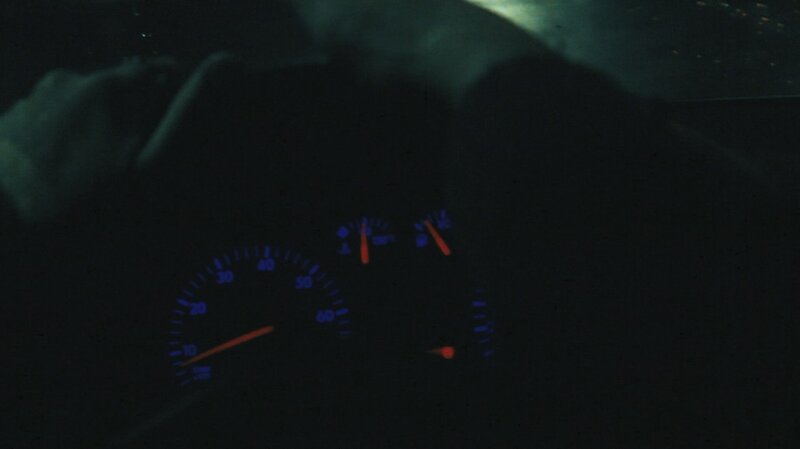 Below shows the initial render of my film with selected sound. I chose the sound based on its dark, atmospheric tones which built up tension in symmetry with the visual elements. The second half of the film includes a different track to the first however the composer is the same meaning techniques, instruments and atmosphere continue to develop. I found a number of sections of the music to heighten the tension for instance the clips where the deer appears and the man squints coinsides with sharp pulses of sound in the track. There was something still not complete about the video for me however. 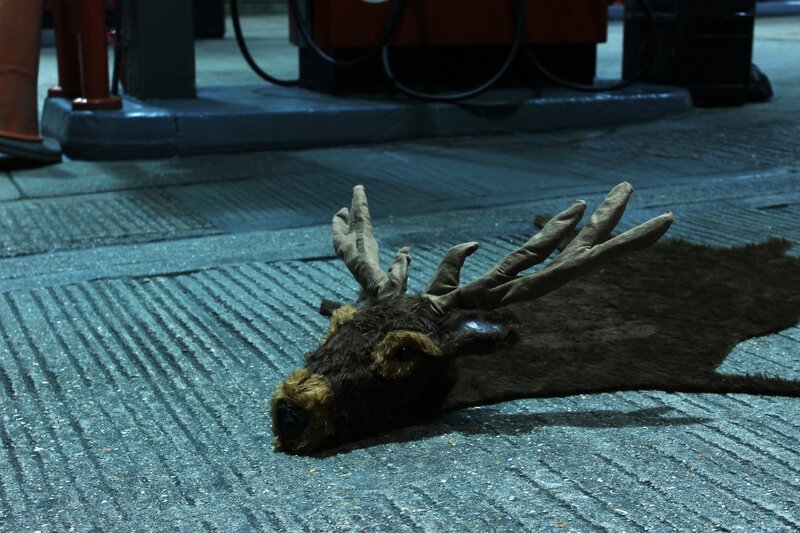 Although I was happy with the narrative, the shots and the music I don't feel the shocking juxtaposition between the car and the roadkill deer is strong enough. I therefore explored a different composition of the film to constrast and compare the two halves of the film at once. I therefore places the first half of the film aside the second half. This developed techniques I explored in Text and Context where I collaged the GIFs to construct the narrative in a different way. Again this technique improved this film. I much prefer how the film flickers from two contrasting narratives. 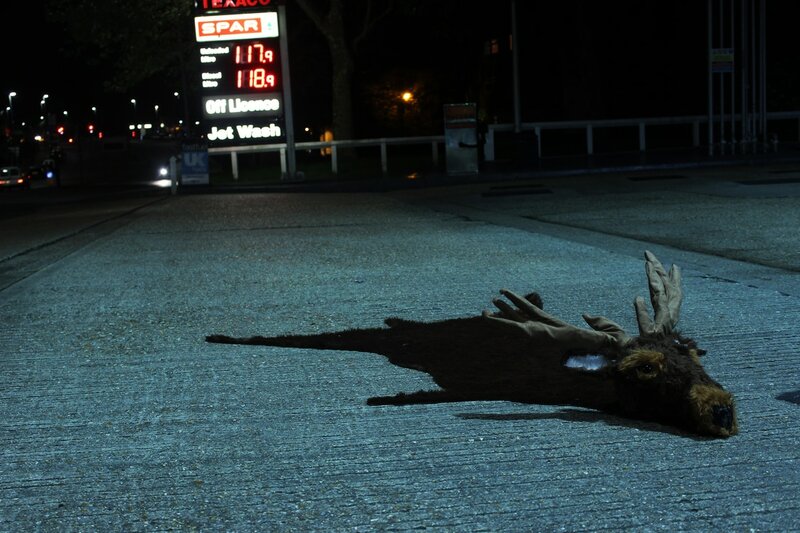 I feel this does extend the juxtaposition between the car and the deer roadkill drawing out narratives concerning how the deer may have died and eventually the realisation that it has become a trophy despite its accidental death. I concluded the film with the deer appearing in the windscreen and the man squinting covering both of the side-by-side clips. I felt this makes the film more powerful as the viewer is forced to confront the deer's iminant death rather than being given the option to watch another clip. This felt a good clip to finish on also as, if the viewer weren't able to understand the narrative, they now should. I feel it may also encourage the viewer to watch again to relate the final clip to the clips previous. Finally I sent the footage over to Jess who kindly removed the grain using a plug-in her boyfriend had purchased. Surprisingly there wasn't a great deal of grain in my footage for such dark shots however the grain removal helped to tidy up any that was visible. Trophy from Tash Tully on Vimeo. Overall I am quite pleased with the film and photographs I've created in such a short space of time. 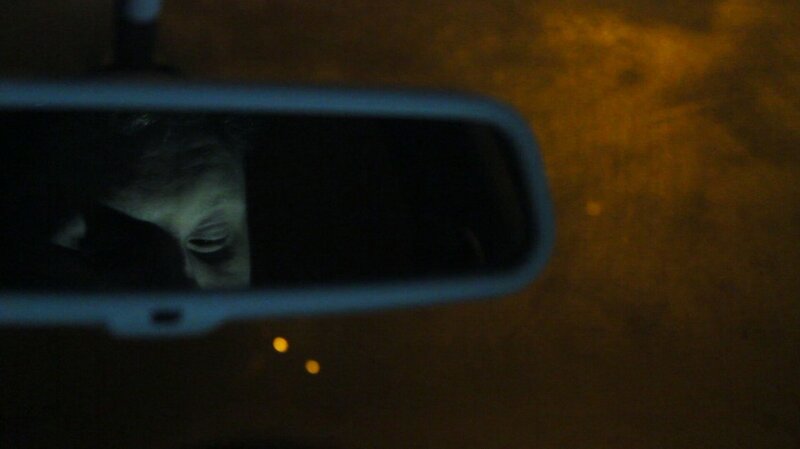 I've not ever worked alone on a film and thus was apprehensive especially when shooting in the dark however I managed to obtain a number of clips I am really proud of. I feel I achieved the atmosphere I set out to in both the photographs and the film and even created a number of life size 3D models. To improve I would consider lighting in a more controlled manner. I wasn't able to get my hands on any external lighting due to the costs and the short time scale however an outdoor spot or flood light may have helped to improve atmosphere and visibility especially on shots inside the car. 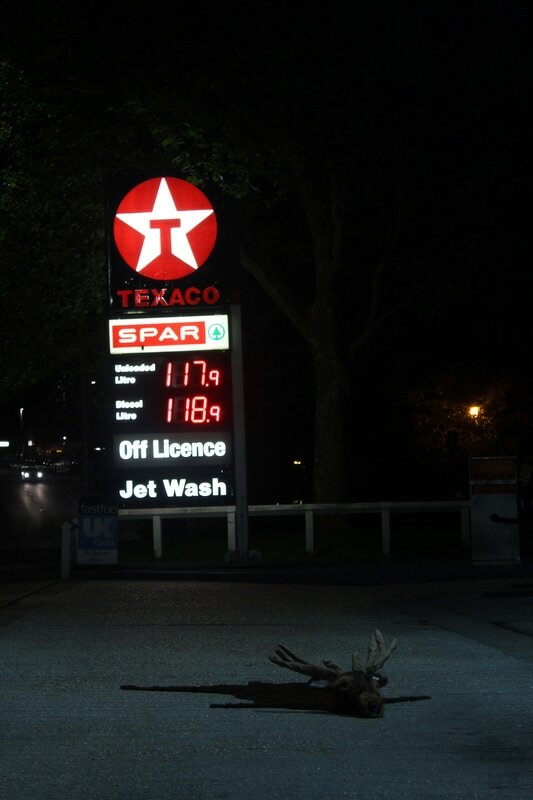 I may also have been able to shoot the deer in other locations as well as the petrol station as I couldn't see the deer well enough anywhere but there. This would allow me to explore static shots where I moved only the light also has I have experimented with in my Re-Imagining The House project. 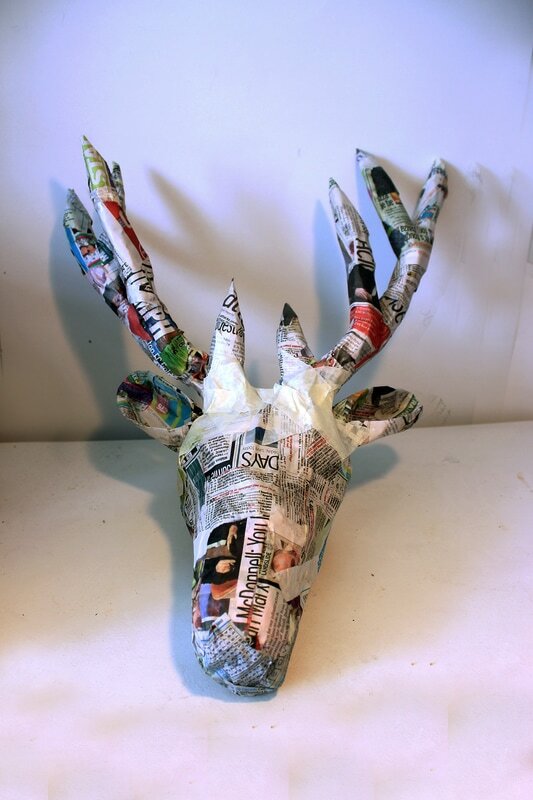 Following filming shots ​for part one of the film involving prodominantly abstract elements of the vehical, I moved into part two where I focussed more explicitly on the deer I'd created. It was pouring down with rain which made filming extremely difficult and uncomfortable however I persevered and as a result, the shots were even more unsettling. I even had a lady approach me to mention how the rain was making the piece look even more uneasy. This was a great compliment since that was the effect I was aiming for. I then again colour corrected the shots in the same style as part one, drawing out the blue tones and darkening the exposure. At first, I wasn't overly happy with the shots compared to the shots of the car however I continued working with them in the hope I could improve them further in post production. They felt more forced and less atmospheric however perhaps this was due to being drenched in rain! I next compiled the clips on Premiere Pro into two chronological sections; shots of the car and shot of the deer. This allowed me to jump bewteen the two visually to juxtapose the vehical with the suggestion of the deer's death. Once I had obtained the chronological order I filmed three remaining shots to complete my narrative. I wanted the deer to be picked up from the road with no suggestion as to where it was being taken. The final shot would show the deer hanging in someone's house. This idea came from the tutorial with Jeremy and Jim where it was suggested that it would be unusual to have killed a deer in such way to have it presented as a trophy in comparison to the usual method where the deer is hunted and shot. I then added these clips to the sequence and completed a test render. 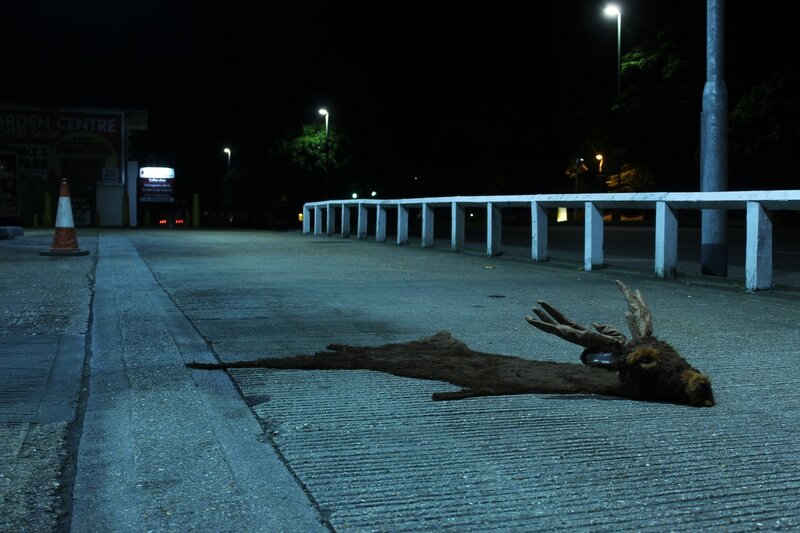 My initial plan was to simply photograph the animal skins on the road since I was worried for time however I finished earlier than I anticipated and therefore could develop the project further. I am so far really happy with the project's progression and the atmosphere I've managed to install in my photographs. I was worried at first since I hadn't ever explored night photography however I obtained a good working process in terms of white balance, ISO settings and so on. With this in mind, I want to extend the static images to moving my creating a short film. 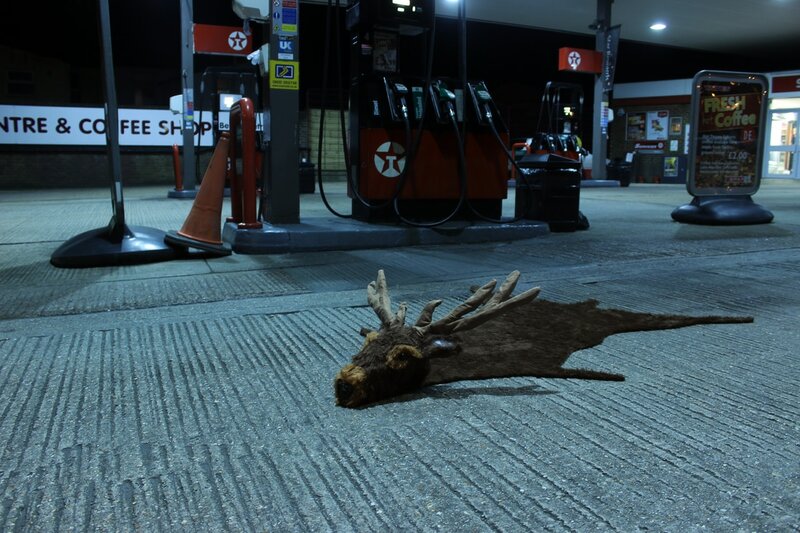 Since I've focussed on the juxtaposition between the animal skins and subverting their meaning by placing them in roads to look like roadkill, I wanted to continue playing upon the contrast between the animal and the car. 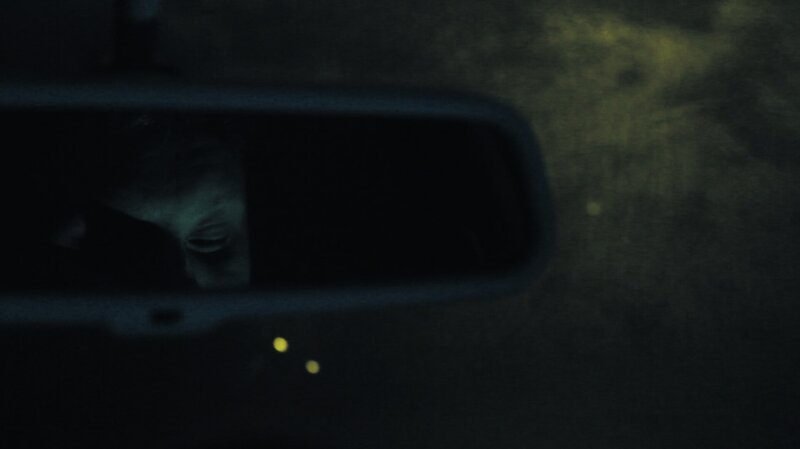 I therefore began noting down ideas for shots for both the car and the deer which I plan to again juxtapose in a film. I wasn't overwhelmed with my initial shots until I colour corrected a few. The raw footage was bland in colour and didn't evoke an uneasy atmosphere however, when I increased the blue tones as in my photographs, the unsettling tones re-emerged. This vastly improved the footage to a standard I was happy with. I began with shots of the car only as it was raining and I didn't want to ruin the model. I plan to juxtapose these with shots of the deer to create the uneasy link between the trophy animal and its death. Above shows a selection of shots from my initial car filming experiments. I wanted the car section to be abstract and creative and not cliche shots of a car in motion etc. I therefore utilised movement greatly such like the bumpy motion of being in a car and also close up shots to increase ambiguity. Finally I explored a clip of a deer suggestively being run over. Since I couldn't obtain this clip myself, I explored online videos which I could cut and edit to suggest the death of the deer. I found a clip on Youtube from which I extracted 3 seconds from. I sped this up to increase the speed of the deer, colour corrected it, added a zoom pan and juxtaposed this with a wince in the rear view mirror from the driver. 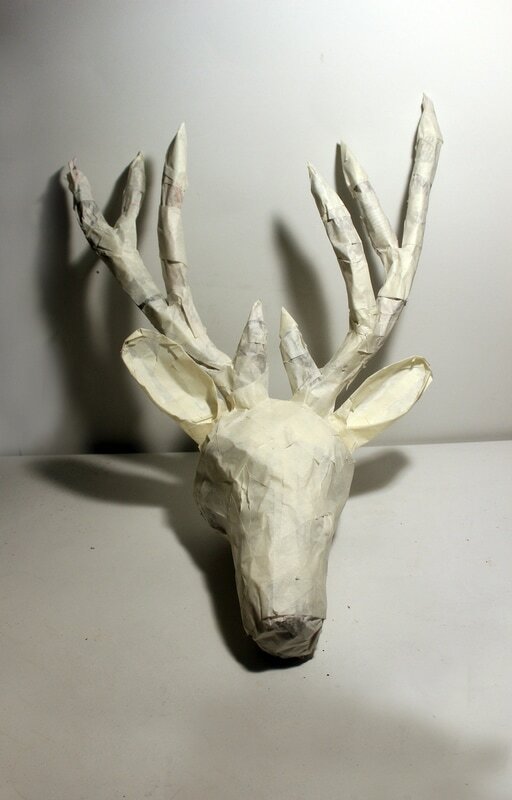 My plan is for the screen to the go to black before continuing with creative clips of my model deer. Today I had a tutorial with Jeremy, Jim and a number of classmates. 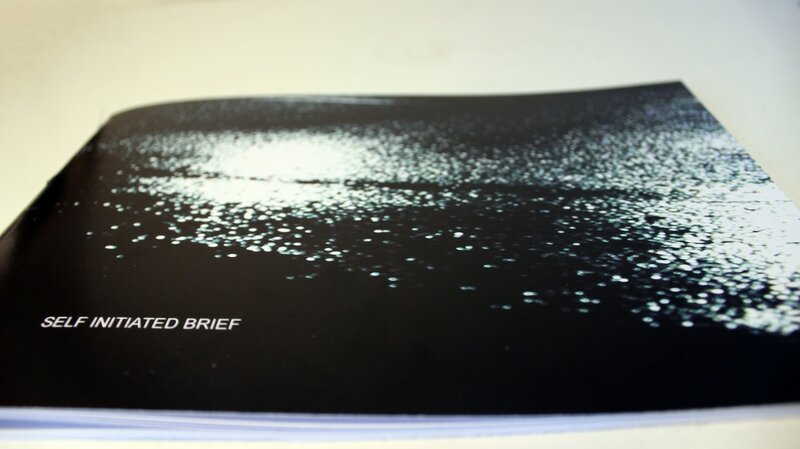 I was overwhelmed at the positive reaction to my project so far which certainly gave me a boost in confidence. I spoke about my plan to create a film following the photographs I'd taken which was given the go ahead by all. Suggestions were made for possible progression following assessment since there was now only just over a week before hand in. Ideas concerned how I could juxtapose my ideas further by showing the roadkill displayed in someone's house. This brings up issues of trophy animals and how these are usually killed through hunting rather than death by car. 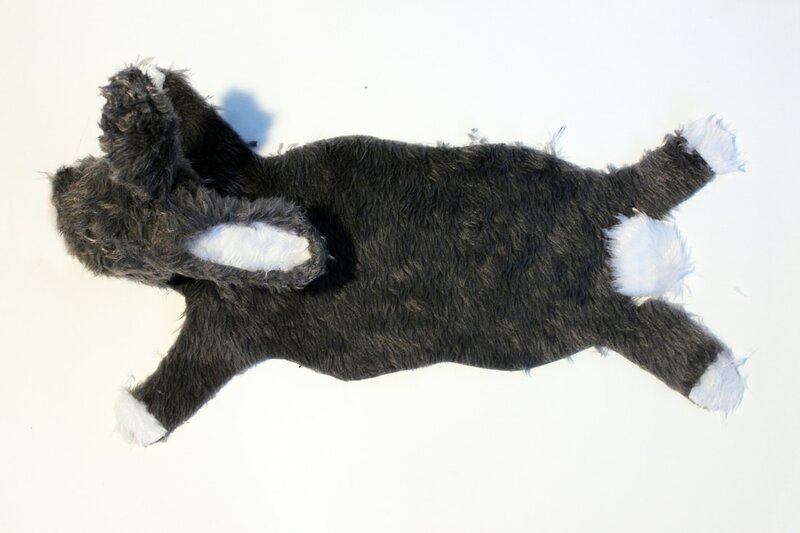 Another suggestion involved flipping the project on its head completely and, instead of displaying a version of an animal usually found indoors outdoors I could put roadkill indoors since this is usually found outdoors. This idea really interested me and may be something I undertake over the summer following hand-in. Overall the tutorial helped me to extend my film's narrative. I was planning to simply explore film in an abstract way, testing out the juxtaposition between shots of the car and shots of my handmade deer. Instead I may include the idea of showing the deer in someone's house at the end to show the idea of the dead deer as a trophy. With my models now complete, I dragged my boyfriend out to scout suitable locations to shoot at. We tried a number of roads, conscious of traffic and lighting. 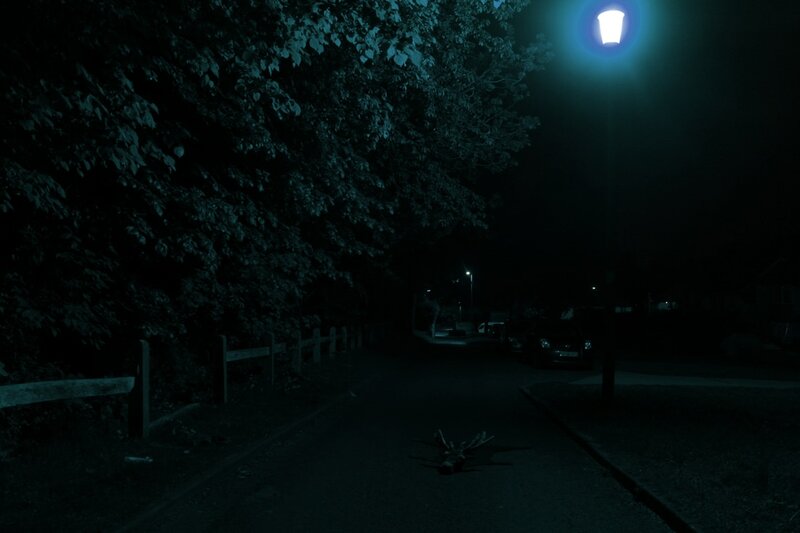 It soon became clear that the light from the streetlights were no where near as strong as I'd have hoped and therefore didn't present the animals strong enough. In search of another location we drove past a petrol station. On the way home we drove in in hope of salvaging something from the trip. As a result the location turned out to be perfect. The lighting was far stronger, making the animals visible and also casting unnerving shadows. In addition, the link to motoring and the sense of roadkill is extended through the reference to petrol and thus cars more explicitly. 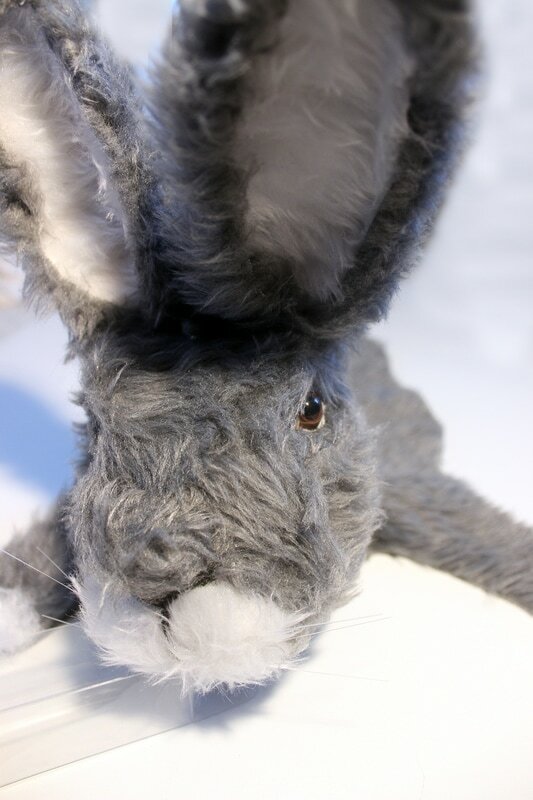 I took a selection of photographs of the rabbit however it soon became clear that its smaller scale was not going to suit wider shots and that, closer shots to gain more detail were too focussed on the model and not enough on the background settings. I therefore progressed with only the deer which worked far better as it was much larger. I am so happy with how these photographs came out. I have very little experience in night time photography and was therefore concerned as to whether or not I would be able to obtain crisp yet atmospheric images however I feel like I did. 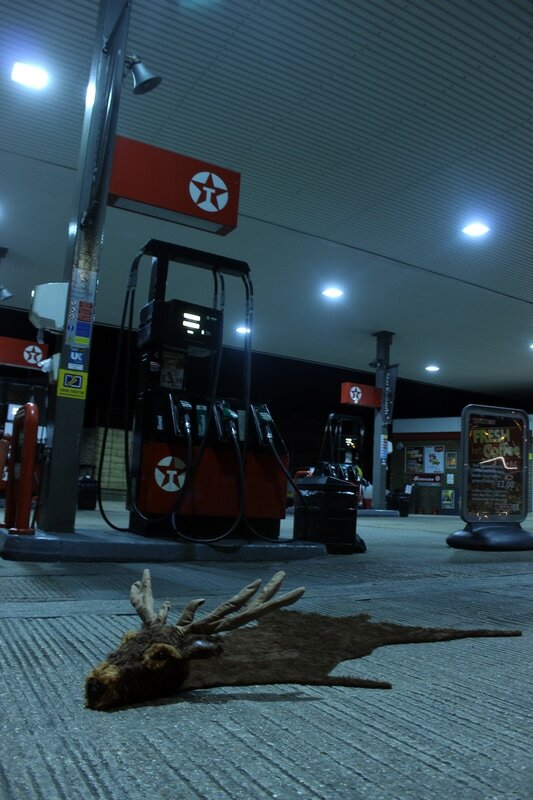 The glow from the petrol station enhanced the eeriness of the concept and the lack of life in the surroundings suggests the animal is left abandoned. I feel the conflict between hand made and realistic is also evidence increasing the juxtaposition. The connection to animal skin rugs is evident, making the viewer question how trophy animals are killed; is it the same as shooting the animal or is the sense of pride deminished? I was surprisingly happy with my final models. Following the completion of the head, I cut out a skin shape referencing images online. I then secured this to the head. 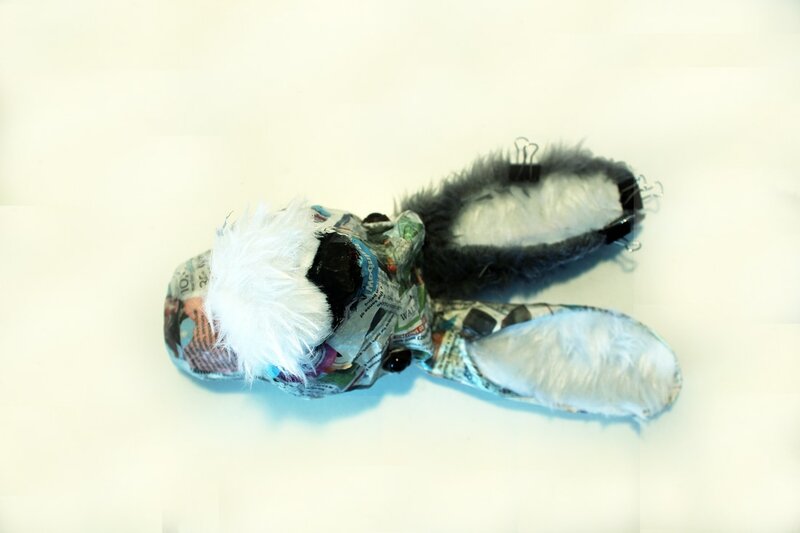 The final outcome shows a combination of 2D and 3D elements much like an animal skin found as a trophy in the home. To me, this combination of 2D and 3D makes the animals appear more distressed. Their back half is flattened, splayed out as a rug but its front half is stretching forward and upward like it is trying to get up. In essence the back half is contained, a captured trophy or rug to bring into the home, while the front continues to move. The models juxtapose a sense of realism and craft simultaneously. They appear both real and fake in an instant. From a distance the models look surprisingly life-life much like that of taxidermy yet up close it is clearly crafted, I feel this adds to the sense of unease I am aiming to obtain and will hopefully prevail in my images outside. 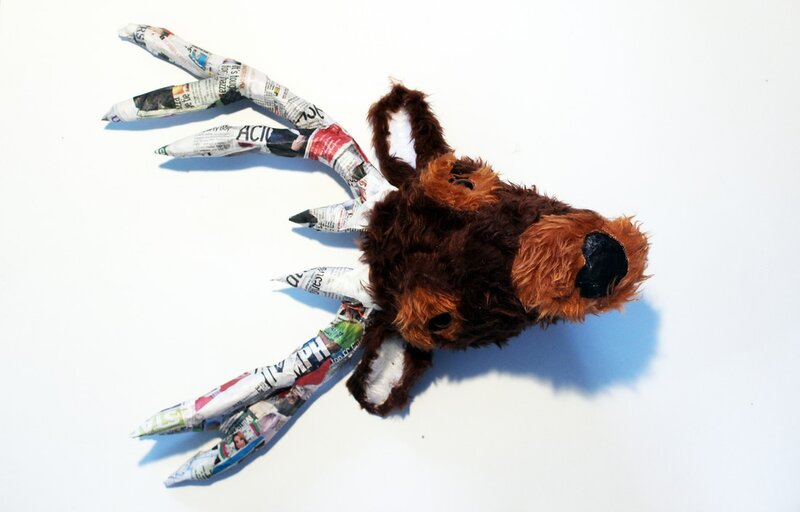 In order to make to scale models of a rabbit and a deer I decided that scrunching up newspaper would be a suitable method since this was how we were encouraged to tackle the puppet workshop last semester. This turned out to be a good decision as it was fairly quick. I next covered it in masking tape to hold the scrunched newspaper in place but also to create a more definitive surface to work with. Whilst working with the masking tape I constructed the ears on both models by securing the tape back to back and bending into place. 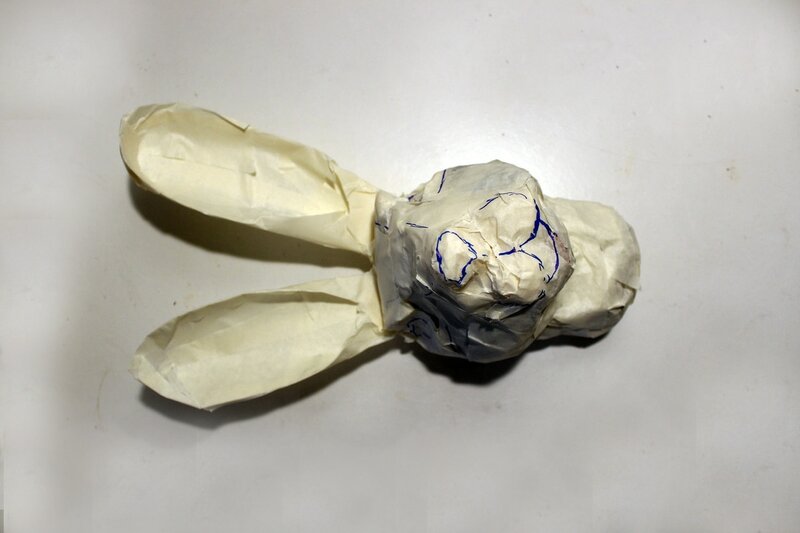 I finally manipulated the tape to create contour details such as the eye brows of the deer and the cheeks/nose of the rabbit. I found it helpful to also mark out the contours with a marker pen atop the tape. I next paper mached over the tape since it kept unsticking. This made the structure more rigid and easier to hold without breaking elements. Following this I inserted eyes. For the eyes I used eyes from old stuffed toys. 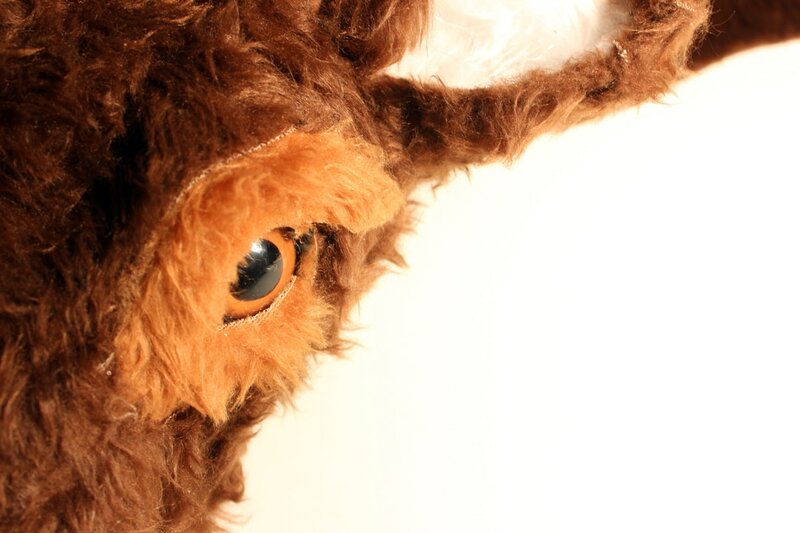 The rabbits eyes were from my initial rabbit experiment and the deer's eyes from a large stuffed tiger. The tigers' eyes weren't quite the right shape so I had to bear this in mind when applying the surface of my models so I could shape them further. 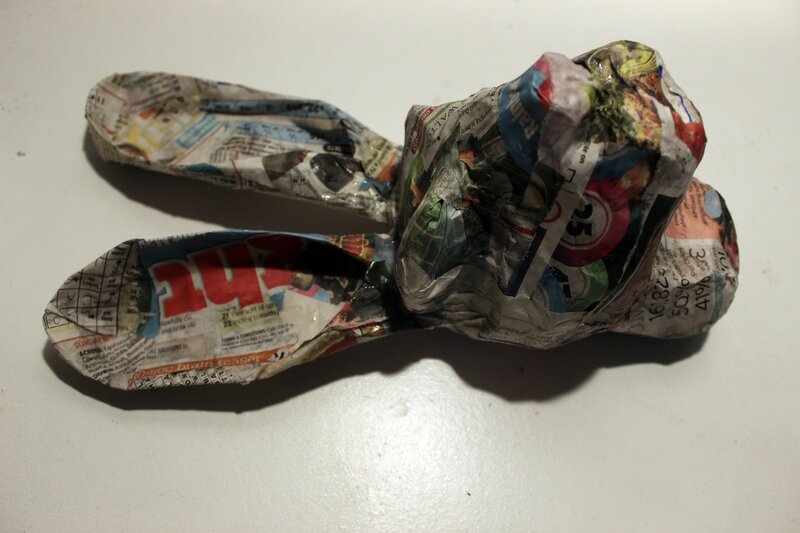 I inserted the eyes simply by pressing them into the newspaper. 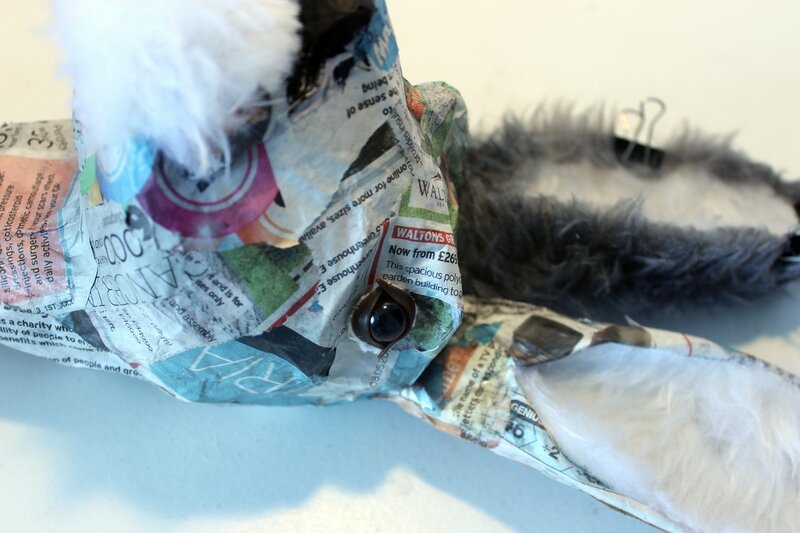 The final step involved covering the paper mached models in fur. I purchased a selection of colours; grey, white, brown and orange; from a local fabric store. Ideally I'd have liked sheets which were more detailed in pattern however they didn't have any. I therefore may experiment with combining the colours to make the models feel less flat. Since I realised I wanted a more realistic depiction of a dead animal, I began considering an alternate way of presenting my roadkill concept. I realised the material needed to be more realistic to obtain the juxtaposition I was after. I therefore decided upon creating half 3D, half 2D models which resembled animal skin rugs. I plan to then photograph them to construct a narrative by placing them in settings such as roads, car parks and petrol stations. This should juxtapose the idea that animal skin rugs may be the result of roadkill impositing a dark undertone and sense of uneasy atmosphere. Gregory Crewdson is an American photographer. His photographs usually take place in small town America, but are dramatic and cinematic. They often feature disturbing, surreal events. His photographs are elaborately staged and lit using crews familiar with motion picture production and lighting large scenes. His work began in formal photography but later became a convoluted mix between his formal photography education and his experimentation with the ethereal perspective of life and death, a transcending mix of lively pigmentation and morbid details within a traditional suburbia setting.constructing a narrative in a still image. Crewdson’s consideration of the grotesque yet intricately created scenes mimic often the themes within my work. I attempt to highly consider each and every element within my work in order to obtain the same narrative mystery Crewdson achieves so successfully. The exploration of form within his own work is also a method I undertake. I enjoy the transformation from initial stage to final outcome in the same way Crewdson’s photos are constructed in detail rather than just focusing on the subject. 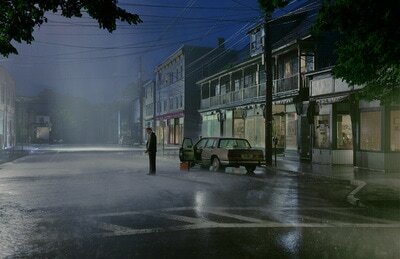 It amazes me how the imagination wanders from the small cues Crewdson provides within a static image. I'd really like to achieve the same sense of thought provoking ideas and atmosphere in static imagery. I plan to therefore construct a number of roadkill animals and photograph them in composed settings to create a narrative. 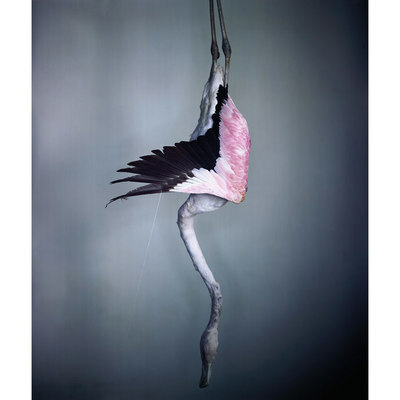 To begin I wanted to explores ways in which I could present the idea of an animal that had been run over. I anticipated that this may be difficult seeing as I hadn't seen any dead animals in detail. 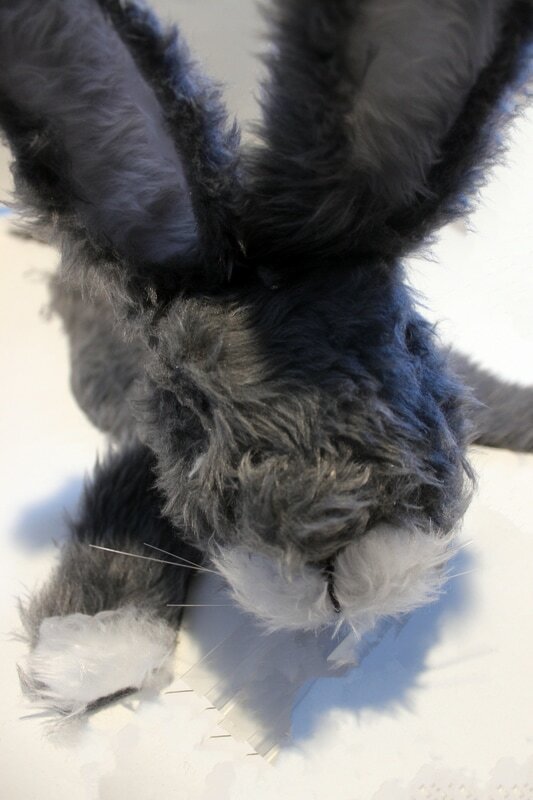 I therefore rummaged around in my loft for a stuffed toy which I unstuffed. 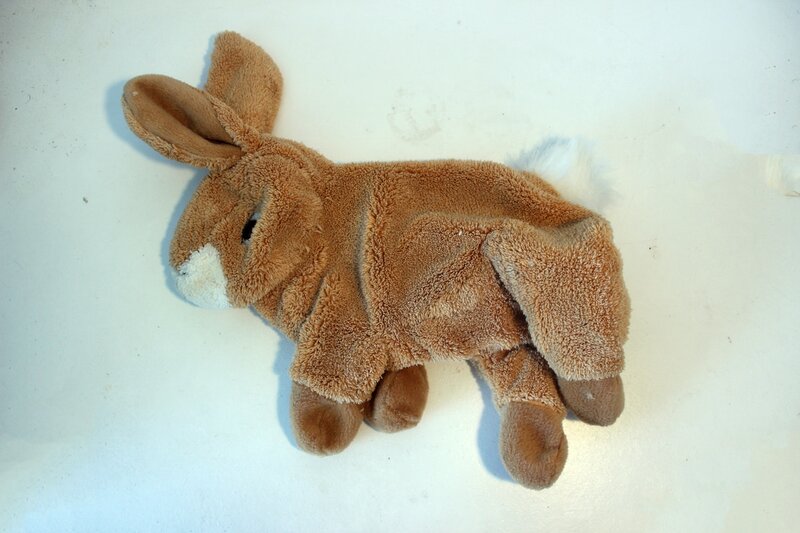 The empty animal, in this case a rabbit, presented me with an unusual way of showing a dead animal with its warped face and undefined limbs. 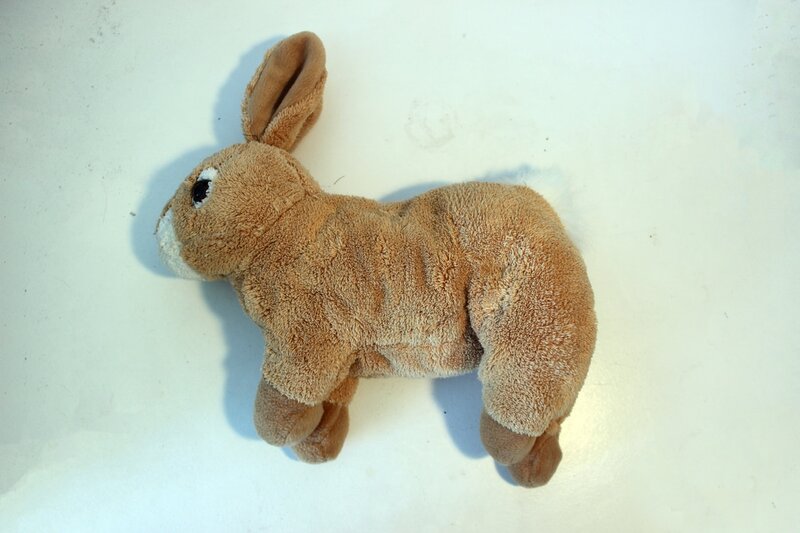 Unfortunately this experiment looked more humorous that unsettling as it is still clearly a stuffed animal with little connection to something living. I therefore concluded that the animal needed to look as realistic as possible to obtain the shock I wanted the viewer's to experience. As a result of this, I began reconsidering my idea slightly. 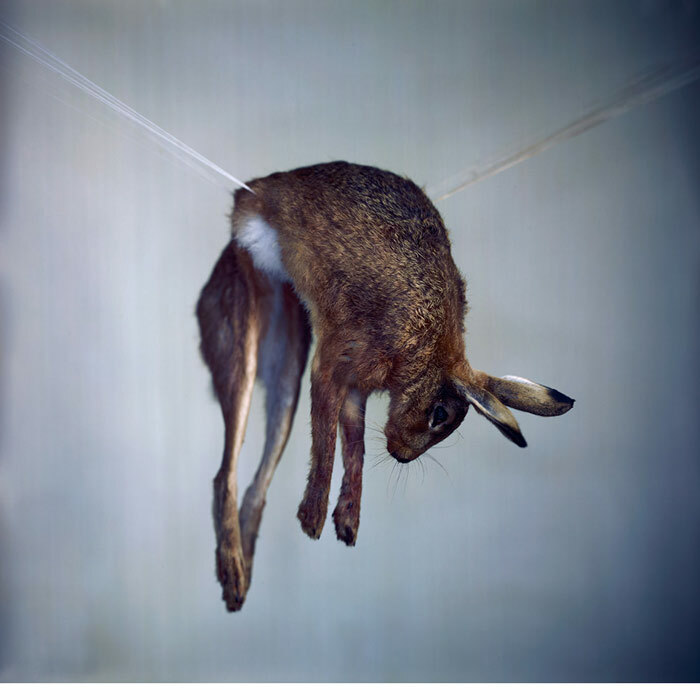 Learoyd photographs portraits of people and still-lifes of dead animals, all created by the camera obscura technique. This process creates photographs of alarming clarity and honesty. 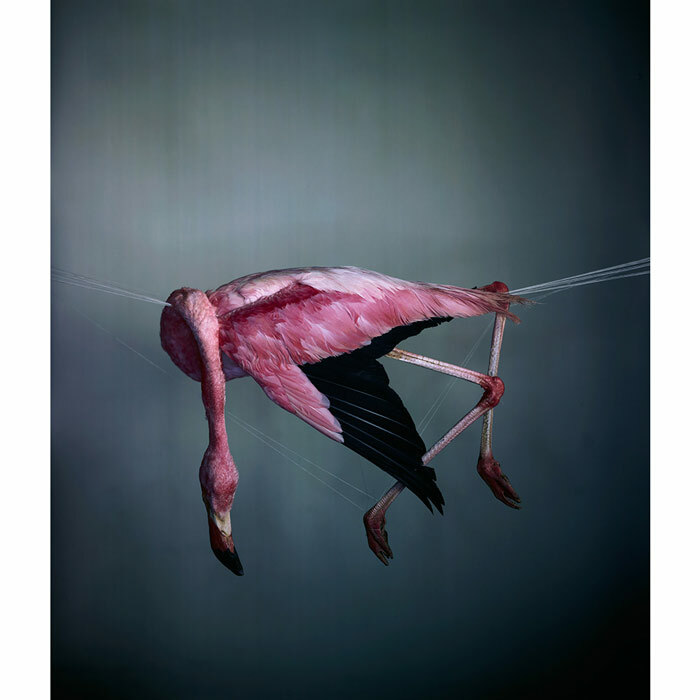 The tactile nature of naked flesh from his portraits adjacent to images of dead flamingos, a dead hare, and a horse’s head, force the viewer to consider both the fragility of life and all its inherent beauty. 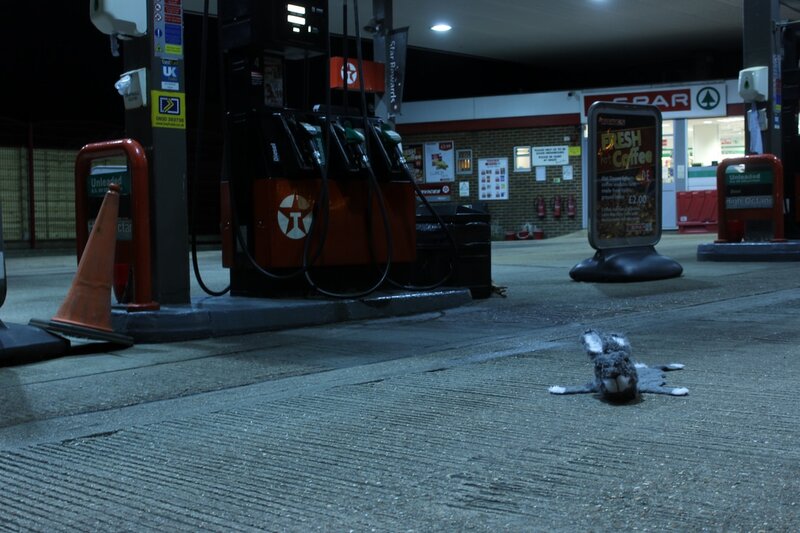 I selected these images to look at relating to my project since they show potential roadkill in situations they would otherwise not be found in. 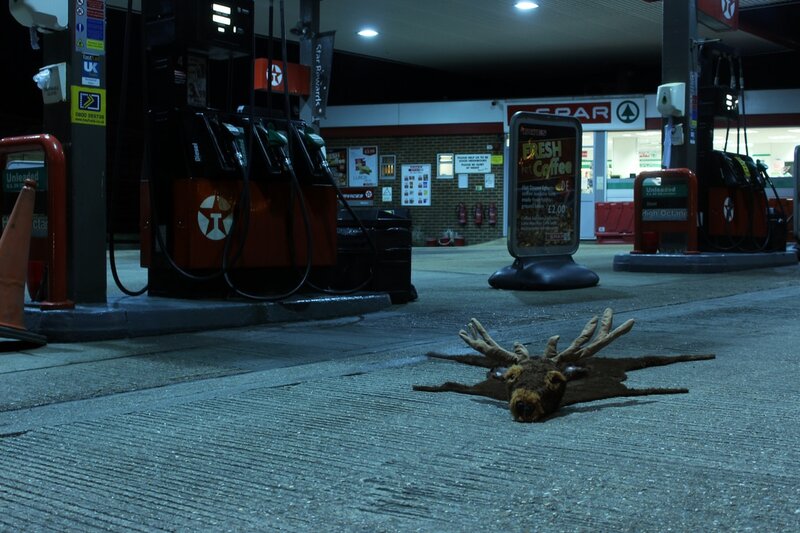 Since my ideas is to somehow construct a number of roadkill animals and then photograph them cinematically in real life environments to add atmosphere and tone, I felt Learoyd's images helped inspire the same sense of unease due to their colouring, depth and unusual composition. 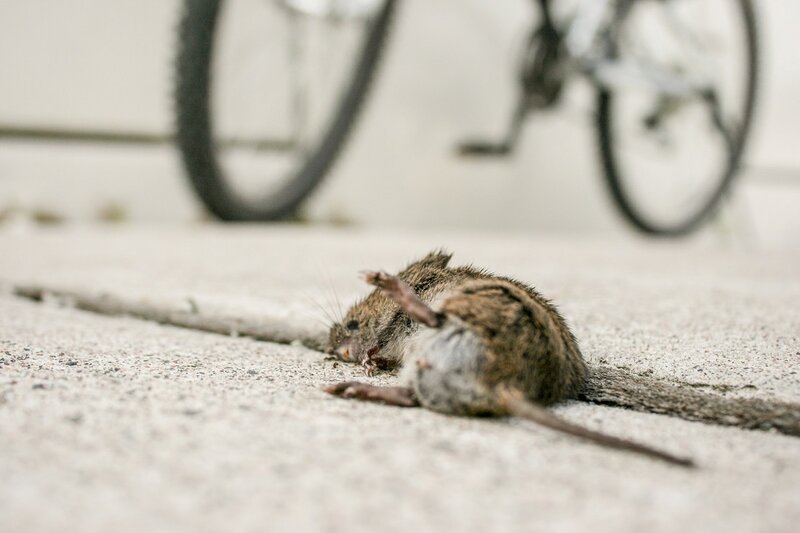 Flickr: Lewdcipher666 "RoadKill: Mouse Bicycle"
I spent a day myself scouting out roadkill to photograph to then experiment with however it soon became clear of the dangers when photographing amongst traffic. 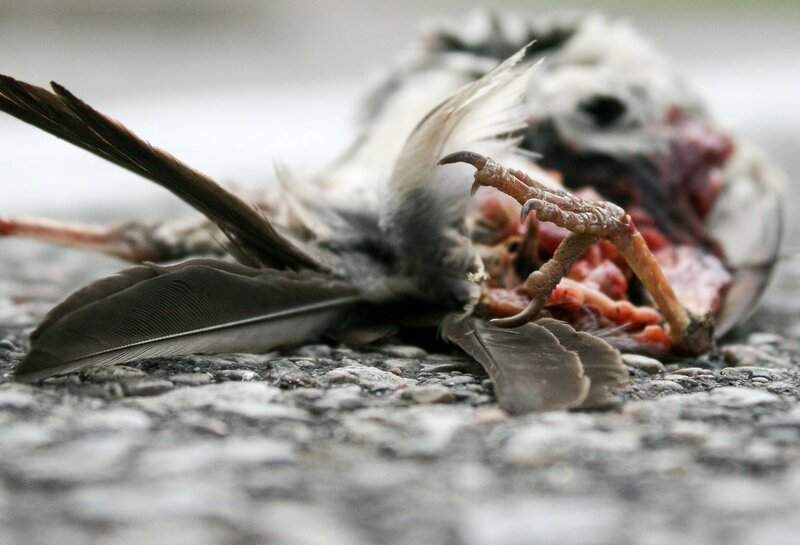 I found a number of dead animals but all on a busy main roads meaning I wasn't able to safely obtain any photographs. Instead I kept a recording of the locations and animal types to potentially revisit in the night time when the roads were less busy. Before beginning I wanted to delve into some statistics to educate myself on roadkill. I can safely say I see a lot near where I live however the chart on the left shows staggering information relating to the number of roadkill found on the UK road network, listed by animal type and road name. 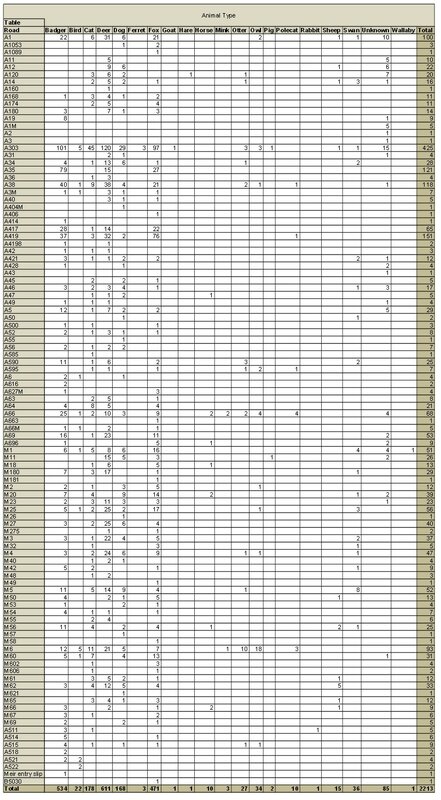 A number of other surveys have taken place and all show the staggering number of animals killed on our roads everyday. A survey by The Peoples Trust for Endangered Species (PTES) started in 2001 showed that hedgehogs remain the second-most frequently seen mammals on roads (19% compared with rabbits at 49%), but, during the first four years of the survey, sightings dropped by 7.5% each year, a greater rate of decline than that assigned a ‘red alert’ by conservationists. Badgers (4.4%) and small mustelids (otters, weasels and so on, 1.6%) are the other animals most often seen. The A303 is by a long way the deadliest stretch of British road for animals, with a frag count of 425 animal deaths. This is perhaps unsurprising once you look at a map as the road, which runs between Basingstoke in Hampshire and Honiton in Devon is something of a rural ride. In a 2016 government published survey deer are the biggest losers, with motorists killing 611 of them of 2213 animals in total. Clearly a great number of animals are killed. 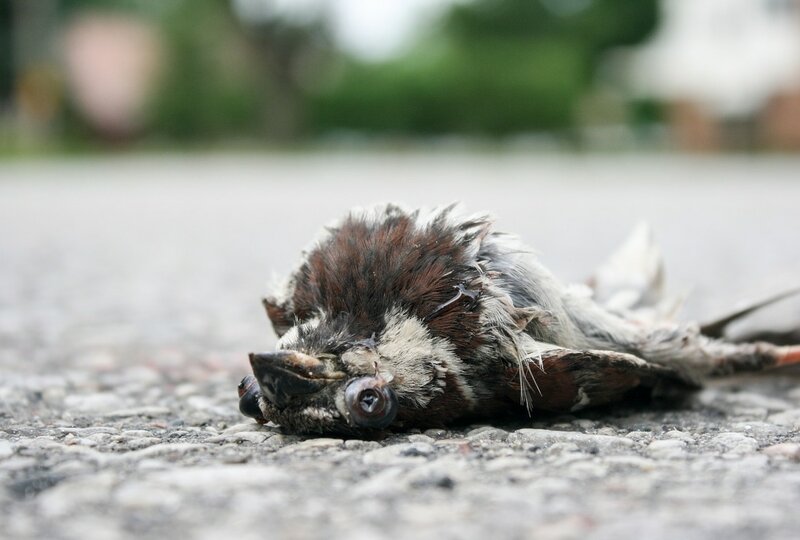 I plan to investigate this myself y going out and photographing any roadkill I can find; I anticipate I will find a great amount since its a regular sight when driving my car. I would like the photographs to make people feel uncomfortable and confront an issue they may otherwise avoid or overlook. I plan to then explore the juxtaposition between the dead animals with an aesthetically pleasing process to subvert my images' meanings. This would cause the viewer to think further than simply what they are seeing. From the workshop it was clear I had no deep connection with my objects however a recurring theme did appear. 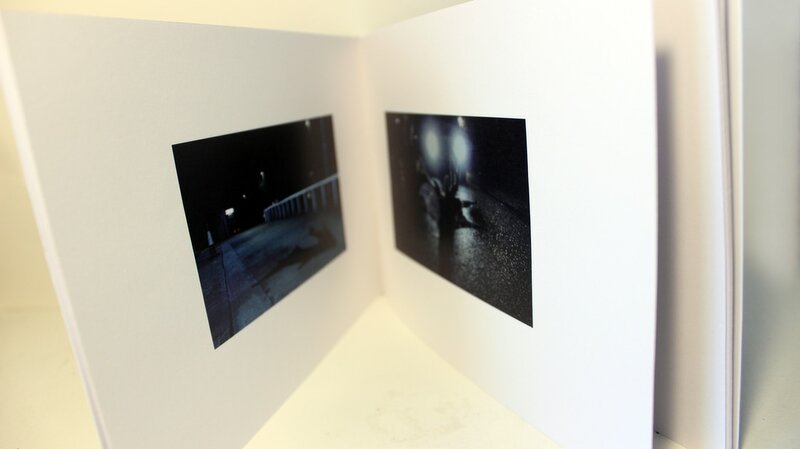 I became aware of an uneasy atmosphere which, when thinking about it further, appears in a lot of my work. I therefore want to make this project personal by working with imagery and subjects people wouldn't want to confront themselves with to create this sense of unease. To do this I could explore aesthetically pleasing mediums combined with repulsive subject matter to purposefully create a conflict of emotion. During the same day I experienced an encouter whereby I was driving and was confronted with a dead animal in the centre of the road. This immediately sparked that feeling of unease I was talking about during the workshop. I continued to think about this dead animal later that day which suggested to me it had really affected me. 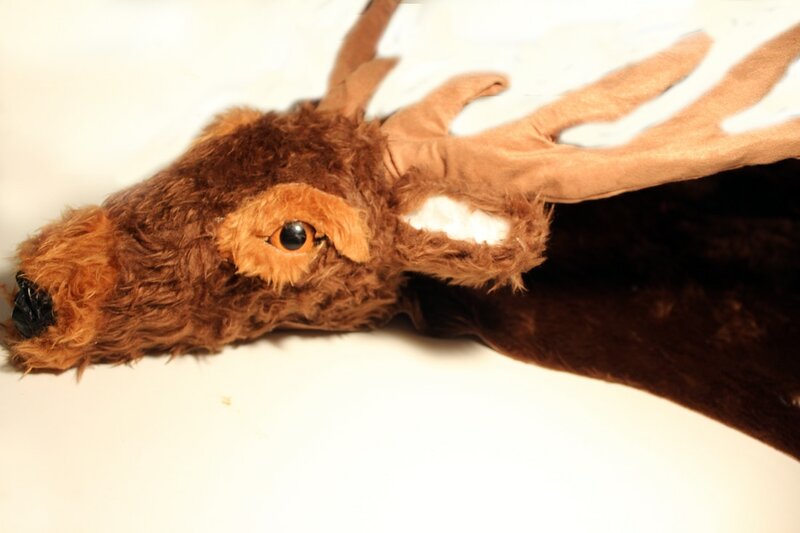 I therefore decided to pursue a theme of roadkill for my personal project. With this in mind, I plan to somehow construct a number of roadkill animals. I will then photograph them cinematically in real life environments to add atmosphere and tone.